Hi there and welcome to my blog! 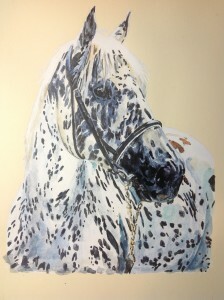 It’s good to have you visit and I look forward to posting a regular series of well illustrated blog posts over the next several years as I pursue my ultimate artistic dream – to become the foremost equine artist in the world! It’s a lofty ambition I know but if you’re going to dream you may as well dream big and then pursue it with the dedication and self belief needed to become reality. I have loved horses and drawing quite literally all my life – officially from the age of 4 when Isaw my first sweaty little pony being ridden past the kindergarten It was life changing as from then on I had to draw them ( and almost nothing else). I enlisted my mums expertise for a little while but soon discovered I could draw them better. Every picture, every sighting was another step and having one of my own became an obsession. I persuaded my parents to buy me a pony for my 12th birthday, followed by a string of increasingly talented horses until at 16 I received Blue Jasper. 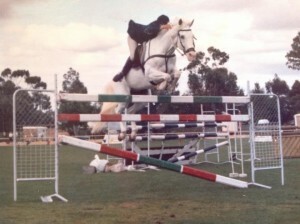 He was instrumental to who I am now as we pursued show jumping and achieved competitive success I never dreamt possible, becoming the best South Australian show jumping combination in the late 1980?s. I studied horse anatomy at uni and then went on to study a visual arts degree and then graduate studies in education and rural business management. After a period of around 10 years farming and bringing up children with my husband Gary I decided to get back to work but initially fitting in everything was an extreme challenge. About 2 years ago I discussed my real passion to make equine art with Gary, and with his wonderful support I pulled out my old equine art business plan (nearly 1 1/2?thick) and got busy immediately. 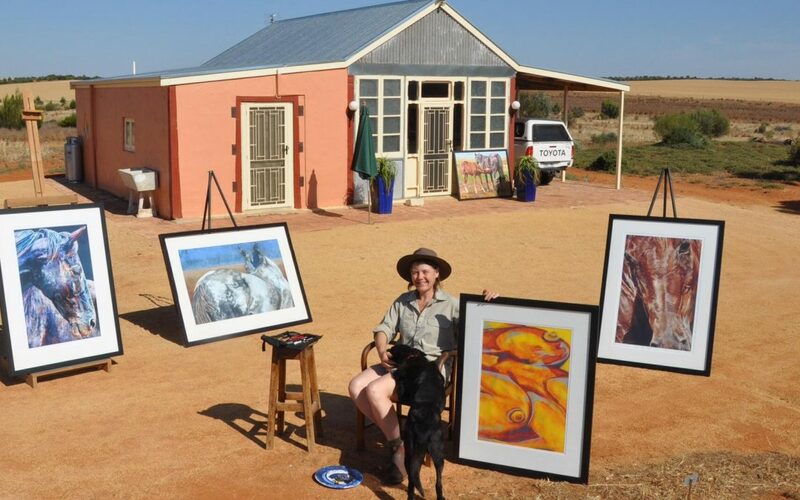 When an artist gets stuck into personal development they tend to go at it pretty hard and in the following 6 months I had produced 5 big pastel paintings and numerous small pieces in inks and charcoal. A group of good friends felt a fundraising farm party was the perfect way to get things moving and one said ‘So you’re going to New York? !’ One minute I was planning to become involved in equine art just in Australia and the next I’m taking on the world?!! I thought for a second and then said ‘I suppose I am – Alrighty then!’. The party was fabulous – we have had two now and have one planned each year with lots of great live music, cabaret, amazing art on offer and a fantastic traditional Australian 3 course dinner, bonfire and camping. That first party was incredible as one guest spent his life savings to buy a big equine portrait. expo and spent 4 wonderful days painting and connecting to people, immediately becoming the event art guru. The small ink series I started for that event has led to a never ending stream of commissions from around the world. I love creating affordable art! My pursuit of the American market has been so exciting and much of it has happened via Facebook. I have used it to research organisations and find friends in the US and it has worked so well I have been invited to stay on properties along the west coast and up into Canada. I have produced a series of small original portraits, a few large ones and my prints and cards to take. 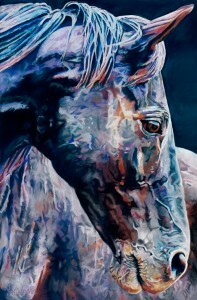 I will be presenting my work to a few big galleries on the west coast and directly to people within the horse industry. I believe in having business relationships directly with my clients, and make art just for them. I will also be attending a big western horse event in Texas before heading home. With me on this trip is Gary and our 16 yer old son Sequoia. We have chosen to travel the country in a motorhome and will pick it up in Seattle before heading up to Calgary and then throughout the western part of the US before leaving it in Texas to fly home. A lot of miles indeed and only 5 weeks to do it all. We will be staying on a number of farms which allows us to become involved in a culture at a personal level with new friends. Well that’s the nuts and bolts of this trip. As dry land farmers we are well used to risk taking (and loads of driving!) and to be honest this actually feels less risky than the practice of farming. I’m working with a solid skill and ability to work hard. I am confident in my ability although this never stops me from striving to be better. This is the first trip in an ongoing annual journey through the US and Canada, all designed to grow a huge network of equine art clients and friends and ultimately have a big solo exhibition at one of my target galleries in the western arts world. So come along for the ride – I’m going into completely new territory and its going to be exciting and so challenging I will be posting every few days and plan to keep you all up to date with all the incredible experiences and challenges, and I’ll be transparent – all the good as well as not quite as good will be in this blog as well as the images and art which happen along the way.